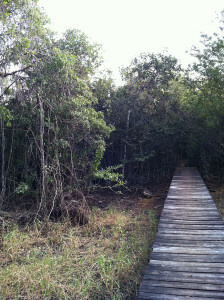 The Mastic Trail bisects Grand Cayman, running a mere two miles north-south through the island’s interior dry forest. With a map and plenty of water I set out to walk it on a lovely February afternoon. It was about 85 degrees in the sun, and I expected to sweat. But the trail is so narrow and well shaded that I rarely saw my shadow. The Mastic is flat, yet bumpy. It gains and loses the same six feet of elevation over and over again. The “ground,” if one would call it that, is jagged eroded limestone overgrown with roots. The limestone is angular and sharp. Each step is an exercise in foot placement, like walking on a jagged lava field. If you trip and fall you will land on the rock and get lacerated. The vegetation crowds in on both sides. In many places the plants are basically shoulder-width apart. Large green leaves of maiden plumb reach across in spots, trying to caress, making for artful dodging. Maiden plum contains urushiol, the active ingredient in poison ivy. The rash lasts two weeks. Ladyhair, a similar looking plant, has fine fibers that irritate the skin like fiberglass. Neither of these is as bad as the big manchineel, a toxic tree whose sap will burn the skin. “Don’t stand under the manchineel in the rain,” warns the guidebook, because the tainted water causes blisters. And don’t eat the fruit, unless you want to die. There is little chance of wandering off the trail and breaking an ankle in a narrow fissure. The dry forest is heavily overgrown. A bushwhacker would literally need to whack the bush with a machete. There are many birds, heard but generally unseen, but one leggy fellow with a long bill ran down the trail ahead of me for some dozens of yards. Presumably it was easier for him to run than to try to fly and crash into the undergrowth. I could hear him rustling ahead of me. And other things rustled. One was a decent sized brown snake. The forest floor was dry, and the skinny, twisting 200-pace boardwalk elevated a few feet off the trail seemed out of place. 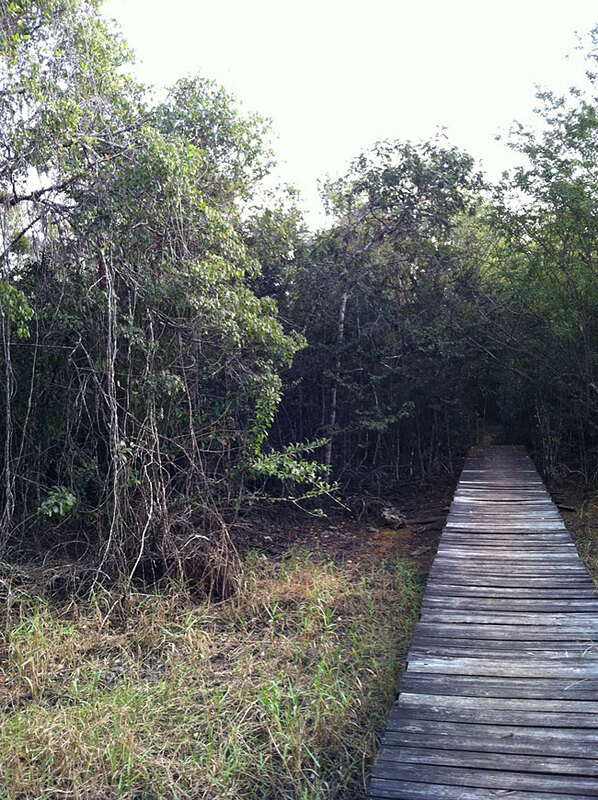 But it threaded through a mangrove area that will flood in the wet season and serve up hordes of mosquitoes bearing who knows what tropical illness. The boards were a little spongier than one might like. The local conservation groups maintain the trail, but there were spots that could definitely use some work. In 45 minutes I figure I got halfway down this claustrophobic path. I saw no other people. Then I decided to turn around. It is not a loop. I retraced my steps, seeing the reverse view, hearing the birds and the rustlings, seeing the bigger snake. When I got to the end I was glad to be out. When I got home I scrubbed hard and missed my Technu. We’re very lucky here in Branford. Our local woods are lovely, dark and deep. And they are temperate. The trails are wide. The footing is good. The rocks won’t trip and rip. The views are interesting, particularly at the top of the hills that are absent on Grand Cayman. And the plants won’t kill you. 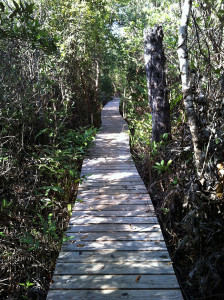 We can walk along the shore at Partnership, and across a truly solid, beautifully engineered boardwalk. We can stroll hand-in-hand, like the couple I saw at Supply Ponds last month. Even our rocks are interesting, like the cliffs at Van Wie, and the scattered glacial boulders at Hoadley. We get four seasons in our woods, not just “dry” and “wet.” They come on schedule and grow to full-force. Go see for yourselves. Admission is free and you don’t have to go through customs and immigration to get there. 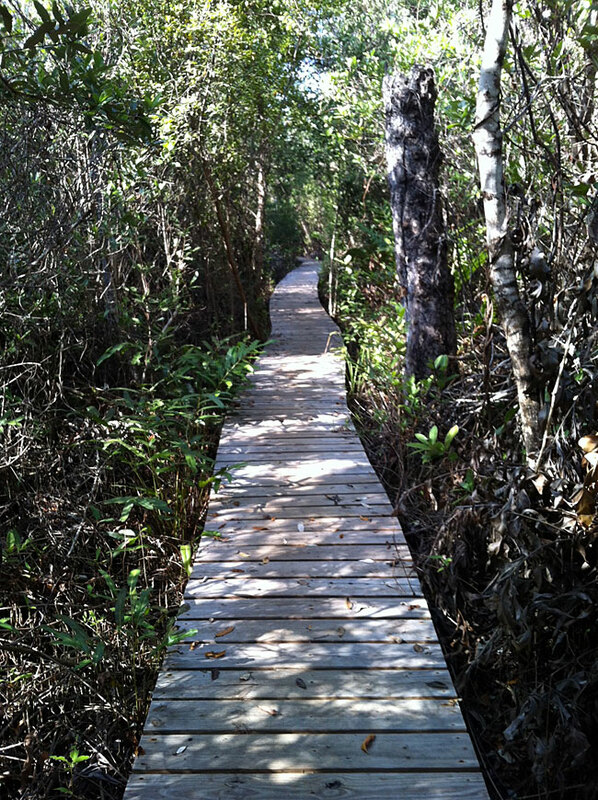 The Mastic Trail runs through the remaining old growth forest on Grand Cayman. It is as far from the beachside condominiums as you can get. Walking it is a remarkable natural experience. Just beware.